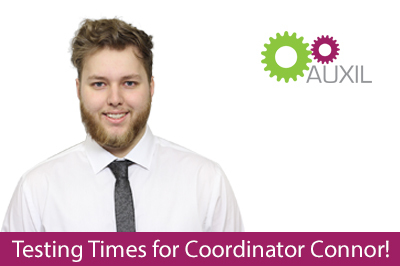 Congratulations are in order for Connor, our new Health & Safety Coordinator, who has been busy in the classroom. He has recently passed a Health, Safety and Environment Test for Managers and Professionals. The test is organised by the Construction and Industry Training Board (CITB) and provides employees with the minimum level of health, safety and environmental knowledge and awareness necessary for working on construction sites. The Managers and Professionals Test includes behavioural case studies, five core knowledge sections and relevant specialist knowledge of key areas: Construction (Design and Management) Regulations, Demolition and Highway Works. We hope Connor will now be encouraged to go on to take further work-related qualifications. As an organisation we are aware of the need to keep up to speed with the ever-changing legislation affecting our industries and we encourage continuing professional development (CPD) amongst all our staff. We also provide training courses in Health & Safety and Human Resources for companies which are detailed elsewhere on our website. If you would like further information or to discuss your company’s own training requirements, please give us a call on 0330 088 4352.